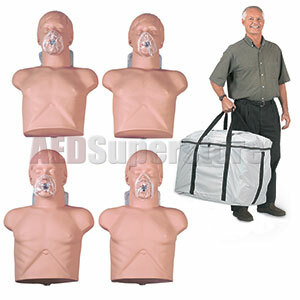 Simulaids Economy Adult Sani-Manikin with Carry Bag. This lifelike adult-size CPR manikin offers a realistic, affordable way to provide each student their own manikin. No cleaning…No disinfecting…No disassembly…Just pack and go! Manikin features: realistic head tilt, single-use airway/lung/face shield system, simulated chest rise, palpable landmarks, and xiphoid process for reference in hand placement. The manikin is light in weight, yet durable for extended training life. Designed to allow the instructor an economical way to provide full materials for each individual in the class. The manikin is not made with natural rubber latex. Size: 20" x 15" x 8"